Style: R20 Blacklight GE 22752 50-Watt BlackLight R20. Features and Benefits: GE's specialty bulbsoffer innovative solutions for a variety of lighting needs. Black Light bulbsare designed with a special filtered glass that absorbs most of the filament'slight, while creating a fluorescent or glowing effect when directed at certainobjects and materials. Bulb Diameter (DIA) [Nom]: 2.500 in, Bulb Finish:Cobalt blue, Filament: CC-6, Manufacturing Source: 3372, Maximum OverallLength (MOL): 3.9300 in, Product Technology: Incandescent, Rated Life [Nom]:1,000-Hours, Voltage [Nom]: 120, Wattage: 50GE incandescent lamps representsthe state of the art of lamps for residential and commercial use, as well asspecial purpose lamps for decorative or display applications. In anincandescent lamp, light is generated by heating the filament toincandescence. The hotter the filament, the more efficient it is in convertingelectricity to light. However, when the filament operates hotter, its life isshortened so the design of each lamp is a balance between efficiency and life.This is why lamps of equal wattage may have different lumen ratings anddifferent life ratings. Incandescent lamps of similar size are commonlyavailable with different wattage ratings. The fixture wattage limit should notbe exceeded. For product questions regarding GE Lighting products, please callGE Hotline 1-800-435-4448, Monday - Friday, 8:00 a.m. - 6:00 p.m. EST Followthe recording prompts or 'stay on the line' to speak directly to a customerservice rep. From the Manufacturer GE 22752 50-Watt BlackLight R20. Features and Benefits: GE's specialty bulbsoffer innovative solutions for a variety of lighting needs. Black Light bulbsare designed with a special filtered glass that absorbs most of the filament'slight, while creating a fluorescent or glowing effect when directed at certainobjects and materials. Bulb Diameter (DIA) [Nom]: 2.500 in, Bulb Finish:Cobalt blue, Filament: CC-6, Manufacturing Source: 3372, Maximum OverallLength (MOL): 3.9300 in, Product Technology: Incandescent, Rated Life [Nom]:1,000-Hours, Voltage [Nom]: 120, Wattage: 50GE incandescent lamps representsthe state of the art of lamps for residential and commercial use, as well asspecial purpose lamps for decorative or display applications. In anincandescent lamp, light is generated by heating the filament toincandescence. The hotter the filament, the more efficient it is in convertingelectricity to light. However, when the filament operates hotter, its life isshortened so the design of each lamp is a balance between efficiency and life.This is why lamps of equal wattage may have different lumen ratings anddifferent life ratings. 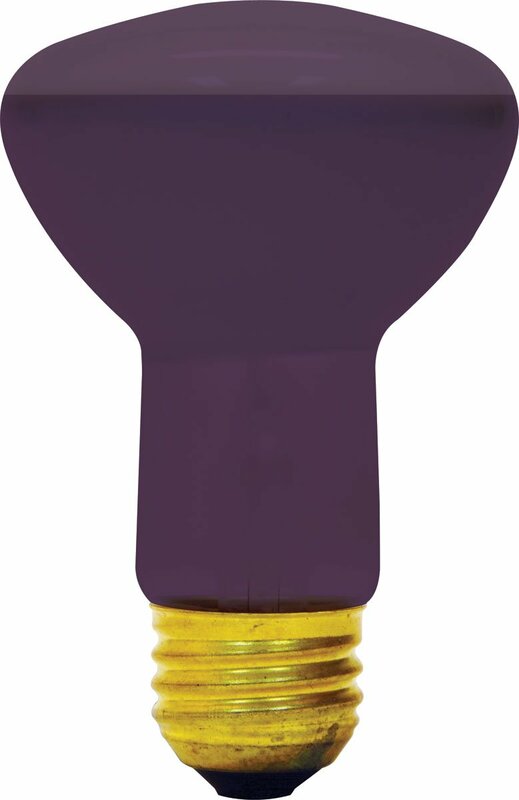 Incandescent lamps of similar size are commonlyavailable with different wattage ratings. The fixture wattage limit should notbe exceeded.